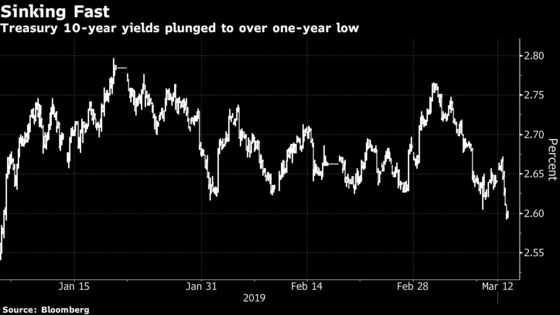 (Bloomberg) -- Treasuries surged, driving 10-year yields to the lowest level since January 2018, as Federal Reserve officials wiped out interest-rate hikes from their median projection for this year and said they’d stop shrinking the central bank’s balance sheet in about six months. The 10-year Treasury yield slid as low as about 2.52 percent Wednesday, around 9 basis points below Tuesday’s close. Meanwhile, the spread between 5- and 30-year yields -- one of the most closely watched parts of the curve -- touched 66 basis points, the widest in more than a year, as futures traders now see about a 50 percent chance of a quarter-point rate cut this year. The projection of zero rate increases this year compares with the median estimate of two 2019 hikes given in December. On the balance sheet, the Federal Open Market Committee said it intends to halt the reduction of its debt holdings at the end of September. “This was a dovish surprise for the markets, as most people weren’t expecting a fall to zero hikes” for 2019, said Blake Gwinn, a strategist at NatWest Markets.